Bring your perfect gem and create your custom Montana jewelry piece. Making a special jewelry item is a fun and rewarding experience. We’ll help you find that perfect setting for your Montana or Yogo sapphire that fits your personal style and budget. Montana Gems offers custom jewelry creations in gold, sterling silver or a mix of both. We offer all types of jewelry options from ladies and gents rings, pendants, tie tacks, bracelets and more. Show us something you like and we can either modify a setting or start from scratch and bring to life a completely unique design. Perhaps you already have a gemstone you’d like to use, we can help find that perfect setting. 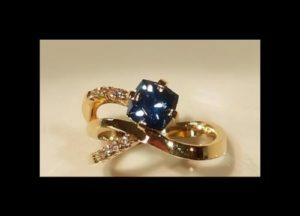 If you already have a setting in mind but need that beautiful Montana sapphire, we’ll check our inventory. If we don’t have it in stock, we’ll check with the miners for that perfect rough sapphire so we can have it cut to your specifications. Often our customers want to design around a stone they personally mined. A custom Montana jewelry item is something to be treasured for years. Whether it’s a dainty blue Rock Creek sapphire or a large, natural El Dorado stone, we can work together to get to your desired finished product. Our gem gallery has a nice selection of loose gemstones to choose from but you’re not limited to stock on hand. If we don’t have it, we’ll do our best to find that perfect Montana or Yogo sapphire. Your choices are not limited to Montana sapphires. We can work with all types of gems and have access to a huge inventory to accommodate your vision. We can fabricate a design from scratch or create a casting where you can view the image 3d prior to production. If you are interested in working with us to create your custom jewelry item, please fill out this form. We look forward to helping you create that one-of-a-kind jewelry piece that you’ll treasure for life. Contact us today for any questions on our custom jewelry process.